No where are laws and legislation a stronger form of social engineering then when it involves the economy and taxation. Tax incentives and the fuzzy math that surrounds our complicated tax system often clouds the issues. Its often not how much money is spent but rather how the money is spent that determines the value of an investment. One obvious place this plays out is in savings, by taxing interest of a simple savings account the government makes the act a far less compelling investment. America’s lack of savings is repeatedly pointed to as a problem, yet laws, that tax interest make small savings accounts a non-starter when coupled with the factors of inflation and bank fees. For a long time I’ve promoted a program that makes the first Two Hundred Dollars of interest from a savings account non-taxable as a way to encourage savings. At a four percent interest rate it would allow for the interest on a five thousand dollar savings account not to be taxed, currently rates are paying a much lower rate. This change would create a more positive savings environment for those most likely to need a safety net from job layoffs, auto repairs, illness, and other misfortunes. Cost to the Federal Government if the holder of such an account were in the twenty percent tax bracket would be Forty Dollars per year. This is far less costly than the assistance programs we must put in effect to help when bad things happen to those with no buffer or savings and their financial house then collapses. Considering all the complex tax laws and legislation Congress enacts this would be one of the simplest to write and enact. This is an easy to implement alternative to complex schemes like former President Bush’s Social Security Reform and ownership society plans. That plan and many others would create huge administrative problems further adding to Governments growth and intrusion into our lives. Something that encourages middle and lower income Americans to save should be built into and tax reform legislation put forth. The value of "something" is not an issue to take lightly. Value is not a constant and can be derived from several factors such as supply and demand or utility value, things can spoil or become obsolete making where you invest very important. Value is not as constant as many people think or always destined to rise. I have discovered that when you start buying things at ten cents on the dollar your money begins to go a long way. This is a lesson many people may soon learn, or maybe not. To buy things at deep discount it helps to have money or the equivalent, it also helps to be able to move quickly. Years ago a business venture took me into an area where I had the opportunity to attend many auto auctions, and often I actually made the bids. I soon learned getting the best price is an art. It is a combination of things, like timing, you soon learned when to step in or how to slow the bidding down thus cooling the animal spirits. Often simply not bidding against yourself was a good start. When it comes to value the market place is the final judge and shows little favor or mercy. One of the favorite stories garnered from this experience came from when a seller complained to the auctioneer about the low bids he was receiving on a car he was selling. When the high bid came in at one thousand dollars the surprised seller said, "but I paid four thousand for that car just last week". The auctioneer's response said it all , "well sir, it is a thousand dollar car today"! This "theory of value" is something that also extends to stocks. These are promises that were at one time no more then a piece of paper known as a certificate that signified part ownership in a company, now it is just a line on a financial statement. How many investors have seen that line vanish? "Value" can change in a heart beat, and we live in a time that information travels at the speed of light. May I mention just two of the great teachers of what I call financial reality, Bernie Madoff and Enron. When it comes to real estate low interest rates and liquidity have a huge impact on value effecting both the value by making it easier to purchase thus driving up prices, and at the same time allowing more building to take place and increasing the supply. When we exceed demand rents fall and people stop buying it as an "investment". Prices must rise more then the natural depreciation from the wear and tear of age or the main driver for owning real estate vanishes. Oversupply is the bane of real estate and crushes the value of this hard and expensive to maintain commodity. Call me a skeptic but I contend that the illusion of value should not be held to close. The value of a building can be altered when a tenant goes bankrupt. The value of a currency drops when everyone starts to sell it and even the value of gold can drastically change if a government confiscates it and makes it illegal to buy, sell or even own can. What something is worth can be difficult to determine. And most of all tell me the value of a promise on paper or implied, remember if you own gold that is represented by a certificate, you own a piece of paper. In our fast moving world some stories that should be noted often are overlooked and ignored. We all saw and heard about hurricane Sandy, in addition to flooding the subway system of New York and halting financial trading Sandy may of even tilted the Presidential election. If Sandy had indeed made a difference in the election outcome one might say Sandy has had the impact of also altering our future. While we are becoming more use to these uncommon "weather occurrences", it is possible that we should be viewing them as a warning of worse yet to come. Most of the world took little notice that on July 21 Beijing suffered its largest rainfall in 60 years. The storm caused widespread destruction and tragedy throughout China's capital, leaving 37 people dead. The rainstorm that created a record breaking 16 inches of rain and has caused $1.6 billion in flood damage. The storm started on Saturday afternoon and continued late into the night flooding everything in its path including major roads and underpasses while also crushing and collapsing homes. I recently saw a picture of Venice Italy where the tourist in the famous Saint Marx Square found more then a little water. Heavy rain and a storm surge had left Venice severely flooded, it was the lagoon city's sixth worst flood on record. 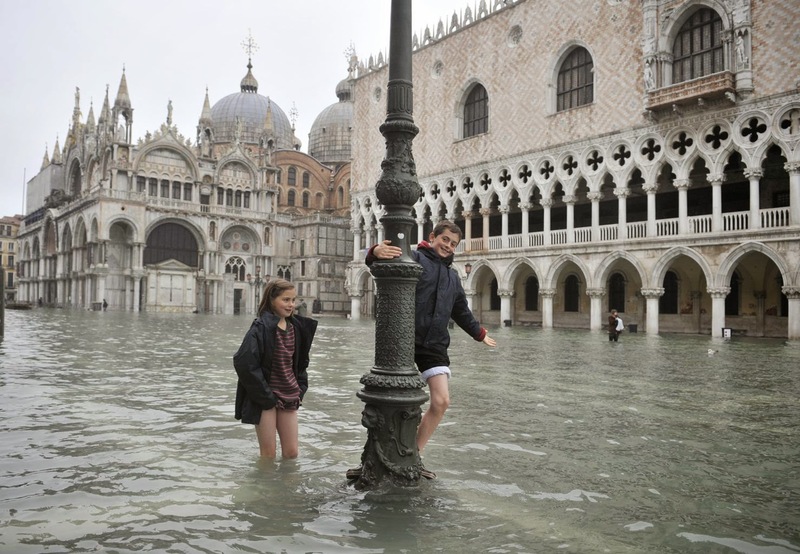 Residents and tourists were left to wade through the city on Sunday, with 70 percent of the city flooded, including pathways along Venice's fabled canals. By late afternoon the level had receded slightly to 4.6 feet above normal. The storm has also caused chaos across northern Italy, including Tuscany. Heavy rainfall and floods in Toscana caused hundreds of residents to flee their homes, in one area 9 inches of rainfall was recorded in just four hours. Are stories like these that a busy world often overlooks or discounts the "canary in the coal mine"? A great number of hot and cold record breaking temperatures have been shattered across the world over the last few years. Droughts and other harsh climate changes that negatively effects crop yields hold the potential to turn our lives upside-down.This is not a new concern for me, for years I have preached quality over quantity and questioned the sustainability of the course mankind has chosen to pursue. It will take years or even decades to make a difference after we alter our lifestyles. Sadly efforts and pain to reset our course will not take place till the pain becomes massive. Are we headed for a double dip, and will we go over the looming financial cliff? Many economist question whether we ever really exited the grip of the "great recession". We should note that the Great Depression had more then one stage. I find myself wondering if the recent higher consumer confidence is merely based on an acceptance of a economic reality called "the new normal" and the result of a positive spin manufactured by a pro Obama media during the election? To my surprise I recently discovered that many people are so poorly informed that they do not even know about the fast approaching fiscal cliff. This term refers to the convergence of two events on December 31, 2012 — the expiration of almost every tax cut enacted since 2001, and a scheduled reduction in government spending. If the experts are to be believed, when taken together these two events threaten to bring the American economy to a schreaching halt. Middle and higher income earners will most likely receive a tax increase, but reality is that all, including the poor are looking at less disposable income going forward. All the government's spending does have a price. To many the answer is putting on another patch attached to another promise, hope abounds we can avoid the pain tomorrow and kick the can further down the road into the future. Just yesterday I heard several financial television shows putting out the idea that the "fiscal cliff" may be more like a "bunny slope" and not have the impact that many of us fear. One fella pointed out that the financial cliff is not etched on the earths landscape but made by man. This optimist went on to say that Washington was ready to make the hard choices and do the right thing. Is this really our economic doomsday? Even the most diabolical demons could not have created a more daunting economic ditch or troubling monetary trough. If the most optimistic forecasters wish to call what faces the American economy a bunny slope they should at least be honest enough to concede that it is ugly. Their so called "bunny slope" may go on, and on, and on forever, and only end when it reaches the depths of hell. The Post Office also known as the USPS has just announced that last year it lost a staggering 15.9 billion dollars. If Washington cannot, or will not deal with fixing this broken arm of government how can we take confidence that they will deal with the far larger problems facing America? The Postal Service employs some 530,000 workers, if this is the governments answer on how to keep Americans working we have bigger problems then most voters can imagine. We should stop every now and then and count our blessings, America has been lucky during the great recession that new methods of locating and taping into deposits of natural gas have increased the availability and lowered its cost. It should be pointed out that natural gas prices have been a huge tailwind to the economy for several years. This is in effect the equivalent of a huge tax cut. While economist often focus on the price of gasoline and oil, natural gas is often overlooked. The drop in price has helped lower the cost of generating electricity as well as the cost of producing many goods, natural gas is a huge component in many plastic and polymer materials. Natural gas has been trading for about $3 per 1,000 cubic feet across the country through much of this year. In Asia, it costs closer to $12. This means that consumers have had more money to spend on retail goods because it has not cost an arm and a leg to heat their homes. It also means a bunch of good paying new jobs in exploration and development in the coming years. America would do well not to squander this good fortune and make the best use of this resource. This type of luck does not often occur. I recently heard a CEO that was being interviewed say he would be putting people on his payroll if he had some clarity as to where the economy was heading. He indicated he was looking for a positive sign before committing to expanding, Duh! The gal doing the interview acted as if she had discovered the answer to all our economic problems. This is another way of saying "confidence" is the problem, but its not. The reality is that much of what we see on the economic landscape is a mirage, all of us who own businesses would be adding workers if our phone was ringing off the hook and a demand existed for our products, but that situation simply does not exist. Like everyone else in my industry I'm sitting on empty office space and buildings, cutting cost, and waiting for demand to increase. Constructing more new buildings while paying taxes, insurance, and maintaining a huge supply of empty space makes no sense except to those in government that are not using their own money. If things were so good, or getting better, the Federal Reserve would not have recently been forced to add new props to the economy through more monetary easing. During a interview last week when asked about the looming "fiscal cliff" former Congressman Ron Paul said we had already gone over it. If he is correct the reason we are not feeling a great deal of pain is that we have not yet hit bottom. The numbers we have to deal with are incredible, they do not add up, they do not work. Much like Greece and Spain who also kicked the can down the road, America can not avoid reality for ever. It appears many people have been caught up in the hype that things are getting better, but that does not make it so. What I am seeing is "fluff", much like what Texans years ago referred to "all hat and no cattle", the people I'm coming in contact with lately lack substance. Like a Texan that is all talk and has neither a ranch or any money most new business start-ups lack funding and have a weak business plan, this bodes poorly for the hiring picture going forward. It is disgusting that this country has such a pathetic and stupid method to select a president. It is now clear that only a few states and counties will decide who will hold the oval office. Recent polling over the past few days shows Mitt Romney enjoying a slight advantage nationwide and Barack Obama holding the edge in the electoral college. This election has been called "too close to call" by many, in truth it is "impossible to call". The final results will depend on what happens on the ground. The latest polls indicate we risk Romney getting a majority of the popular vote but Obama being reelected based on the electoral college. In 1992, millionaire Ross Perot damaged the incumbent George H W Bush and helped to propel Bill Clinton to the White House with only 43% of the popular vote. And Ralph Nader is still vilified by some Democrats for taking crucial votes away from Al Gore in Florida. It is most likely that the few minor party candidates that are running will not effect this election, but they could, as even a few votes could skew the results and tilt the election. If a gap exists between the enthusiasm of either candidate's supporters it will determine who is the next President. The so-called "swing states" will make our choice for us. As we look at a swing state, we must ask what influences the vote in that particular state. Factors like their unemployment rate and the demographics, Obama benefits if a state has an unemployment rate below the national average or a large number of minorities reside in the state. One thing is clear, this system needs to be changed, it makes a mockery of the idea that every vote counts. If you look at the areas getting attention, or where the money is being spent, you quickly realize some votes count a lot more than others. The authorities are acting primarily to prop up governments as well as the economy by saving the financial system. It is important to remember these authorities are politicians and bureaucrats that want increased power and influence, and guess what, they may have hit the jackpot. Those in power have joined with the banks to create the "Financial-Political Complex" that promotes the current fiscal policy and supports banks that are "too big to fail". Many people say that the way out of the housing crisis is to let everyone fix their mortgage debt at super low fixed rates, then inflate, inflate, inflate? Well, perhaps the government's way out of its own debt is to secure low fixed rates for itself then inflate away when it becomes necessary.It should not bring comfort to the average man that these to unholy forces have joined together in such a union. Who is the principal borrower at today's rates? The banks don't seem to be using the cheap money for their traditional business of lending, but it is the government that is doing the borrowing, and getting away with amazingly low rates for long-term debt. I wouldn't buy a 10 year Treasury at today's rates - I have no idea why others are doing it - unless it's the Chinese exporters who figure they still benefit. I bet the politicians can't believe their luck at being able to borrow and spend at these rates, the printing press is being used to keep the game going. As unstabilizing as the military and war can be to our lives, financial disruptions can also have devastating effects. Banks have been big buyers of government bonds in the past couple of years because of the “carry trade,” this allows them to borrow money from the central banks at low rates and lend it back to the government at a higher yield. In effect, this is a subsidy to the banking sector. Banks may buy even more government bonds in future because international regulations assign a low capital charge to government debt and because banks will be required to hold a store of liquid assets, of which bonds will be a big part. So the government stands behind the banking system, and in turn, the banks are big buyers of government debt. This financial-political complex is reinforced by the general unwillingness of governments to let banks go bust. Better to intervene so heavily in markets, the argument runs, than do nothing and repeat the mistake of the Depression. The cumulative effect of steps taken by the authorities over the past five years designed to prop up the economy and save the financial system has resulted in the creeping nationalization of markets. Central banks are the biggest players in many rich-world government-bond markets. Equity markets seem to perk up only when central banks are expanding the money supply. Banks exist to channel funds from savers to borrowers, traditionally from the household sector to companies. But modern banks raise funds not just from retail deposits, but also from the markets. Until 2007, European banks were able to borrow more cheaply from the markets than the better corporate borrowers. But for the past five years, banks’ borrowing costs have been consistently higher than those of non-financial firms. This raises huge question-marks over the banks’ role as intermediaries. Loans from the official sector are being used to reduce the impact of private-sector capital flight. Huge amounts of money have left Spain and Italy, largely as foreigners withdrew bank deposits or sold government bonds. The net effect is that several countries are substantial debtors of the ECB, while Germany, Finland, and Luxembourg are net creditors. Money is flowing across borders at record rates. Funding pressures have been relieved by massive amounts of liquidity from central banks. Private-sector funding has been replaced with official lending. Central banks have been “lenders of last resort” for banks since the mid-19th century making short-term loans made at moments of panic. This time the ECB has lent a staggering €1 trillion ($1.3 trillion) on a three-year basis. The hope is that these loans can be refinanced via the private sector in 2014 or 2015. But this may be too sanguine. The funding woes of banks are already almost five years old. The bond market has never been fully free of central-bank influence: expectations about the future level of short-term rates have always influenced yields. But the Federal Reserve has said that it will keep rates at current low levels until late 2014, an unprecedented commitment. Central banks have been putting downward pressure on yields through substantial quantitative easing (QE) programs. The Bank of England owns almost a third of the gilt market, this means that yields are not set solely by the balance of supply and private-sector demand. Nor is this the only rigged market. Many countries are following policies that are designed to drive the value of their currencies down. And the authorities are helping to prop up share prices: Ben Bernanke, chairman of the Fed, has welcomed a higher stock-market as a side-effect of QE. As a result, it is difficult to say what message the markets are sending. Do low bond yields show that investors are endorsing Britain’s deficit-reduction program, for example? Or do they mean that the government has plenty of room to ease fiscal policy and borrow more? Thanks to QE, it is hard to be sure. History suggests that once governments get involved in a sector, they find it hard to withdraw. Given the weak outlook, it is hard to imagine the circumstances in which liquidity support for the banks will be withdrawn, or the policy of low-interest rates abandoned. This is a new financial and economic era. QE and ZiRP haven't forced investment but rather sent people running for cover. More of the same is not a resolution to deep-rooted problems but does represent the evil character of finance for the moment. I predict a financial washing machine in the near future that will repeatedly agitate, rinse, spin, and strip away the wealth and savings of most citizens. It seems to me there is every chance that in time the people and the market will regain control of money from big banks and governments, after all, banks only exist to distribute money, and for this minor service they are paid exorbitantly well. The character of money is changing with technology, that determines who can raise it, and how it is exchanged. It will take time as our culture changes but technically we no longer need banks or even the government for this. We should be very afraid of the "Financial-Political Complex" and the current policies because both have disaster written all over them. The GDP came out this morning, up 2.0% rather then the 1.8% that was expected. This is still very slow growth. What should be noted is that Government spending on defense outlays jumped 3.7%, the biggest increase since mid-2009. In all spending by the Federal Government was up a whopping 9.6%, this was responsible for the growth. Again this economy is being held up by the government, strange timing right before the election? Another thing that should be called to our attention is inflation is again approaching the 3% area. With consumer spending around 2% we still see no real growth. Business investment outside the residential sector fell 1.3%, the biggest drop since late 2009. Disposable income moved up 2.6%, but that was down from a 3.8% increase in the second quarter. The personal savings rate fell to 3.7% from 4.0%. A celebration is not in order. FOOT NOTE; entered mid January, 2013-------- Now that the holiday retail sales have been weighed and measured, they have come up short. Rolling into the fall many called for the best retail sales ever and imagined increases of around 5%. After quietly tamping down their expectations, just yesterday it came out that sales beat expectations, with a gain of 0.3% excluding auto. This is pretty sad when you factor in inflation. I do love the way the media can spin a story. The CNN debate moderator Candy Crowley clearly was in the Obama campaign's corner giving him the close on 8 of 11 questions and only interrupting him 9 times while interrupting Romney 28 times. The lowest and most dishonest part of Crowley's disgraceful "moderation" was when she actually jumped into the debate to take Obama's side regarding the death of four Americans in Benghazi. To cover for his administration and his lying for almost two weeks about the attack coming as the result of a spontaneous protest over a You Tube video. Obama attempted to use as cover the claim that he had called the attack a "terrorist attack" on that very first day during his Rose Garden statement. Romney correctly disputed that. Crowley, quite incorrectly, took Obama's side and the crowd exploded. Yes, the most shocking thing in the debate was when Obama lied deliberately to us about what he said in the Rose Garden and Candy Crowley inappropriately backed him up. A gloating Obama chimed in, “Can you say that a little louder, Candy!” He later scolded Romney about how “offensive” it was for him to question the administration’s selfless intention. But even the hyper-partisan press could not sanction this lie for long. After the event, Ms. Crowley quickly backtracked, admitting that Romney was “right in the main.” This is like in an umpire deliberately getting in a runner’s way, calling him out during a decisive World Series moment, then admitting the call was blown at a post-game press conference. Benghazi, the White House cover-up and an enabling media offer a microcosm for the whole Obama presidency. His economic policies have been wasteful and counterproductive; doing more to buttress cronyism than bring recovery. His social policies radically depart from traditional American values. Obama’s foreign policy is in shambles. Obama came out on the anniversary of 911 speaking about the fact that we would not run run from terrorists speaking generically with no reference to Benghazi. He then sent Susan Rice out to 5 times tell the news media the attack was due to a video, Hilary Clinton said the same, Obama said the same to the families and then he went before the UN and said 8 times, the problem was the video. At the debate Romney asked Obama if he had come out immediately and called the attack what it was seen to be by the White House Security, a terrorist attack in real time. Obama looked right at Romney and lied and said he did say it was a terrorist attack. 60 million people saw this man just sit there and not tell the truth. Romney looked stunned. Why did Candy have a copy of the”transcript” of that one Obama Speech? And how did Obama know she had a copy of the transcript of that particular speech, he asked her to refer to it. Sounds like somebody (Obama) knew what the question was going to be, and sandbagged Romney by ensuring that Candy was going to have the “transcript” on her table and believed the answer Obama was going to give. Then the drama, Obama: “Please proceed Governor,” and Obama: “get the transcript.” How did Obama know what the question was going to be and how Candy would reply? Candy was the only one who picked the questions. What other documents did she have? Us with inquiring minds would like to know, and why is no one asking? From the transcript on the Wall Street Journal site: "No acts of terror will ever shake the resolve of this great nation, alter that character, or eclipse the light of the values that we stand for. Today we mourn four more Americans who represent the very best of the United States of America. We will not waver in our commitment to see that justice is done for this terrible act. And make no mistake, justice will be done." To clarify, in this transcript of his speech Obama did not call the 9-11 attack in Benghazi a terrorist attack. When you watch a replay of the debate it is clear the American people are being set up and mislead. This was a cover up by the Obama administration because it was too close to the election and it has blown up in their face. In all 3 debates so far, the democrat has had several minutes more to speak than the republican. Obviously mainstream media is backing Obama, but the public is favoring Romney anyway, we could be looking at an election where Romney gets a majority of the vote yet Obama stays in office because of the electoral college. The media and the public seem to be viewing the debates as the MLB World Series. This is not a best of 7 game were playing here. Who wins the debate or blasts his opponent with a knuckle sandwich has no bearing on the outcome. The content of the candidates has become boring, predictive and a lathering of fixed message points hurling "you are bad" epitaphs at each other with little substantive content. It's not only America that is playing this distraught game. Governments all over the world are plunging into theatrics with hands waving, waiting for the audience applause. It's the wrong game at the wrong time and it's a very sad comment on our culture. Is Bill Clinton running against George Bush in the 2012 Presidential election? With all the campaigning Bill Clinton is doing, and the constant line drumming from the White House that America is facing a return to the policies that got "America into this mess", a voter might get that impression. The truth is Barack Obama and Mitt Romney are the choice flavors of the day. While Obama holds the edge when it comes to style, and a "cute" use of words, such as "sketchy", this election is about the economy and getting America going. When you compare the resume of the two men that are running Romney wins hands down. While the media has gone on to calling Bill Clinton, "the explainer and chief" I still remember him by the moniker, Slick Willie. Etched into my memory is the image of Bill Clinton during the Monica Lewinsky scandal pondering the definition of "IS". Sometimes as we look into the rear-view mirror things become bit distorted. To many Americans looking back in time and seeking a more gentle existence, Clinton has morphed into the best thing since sliced bread, but in reality he may not of been so good, he was just followed by something worse. While not coming across as the most engaging and likable, Romney's resume shouts "most competent." Romney has a history of serving his fellow man but a religious background that makes talking about it a form of bragging. He is hard working and well anchored. I suspect that the American people would not see him taking expensive vacations with a large entourage at the taxpayers expense. The most telling sign, twice recently I witnessed on news clips that as Romney arrived at events he exited a car and his plane carrying his own bag. Is your pension at risk? Most companies have a product or service from which other lines of business can grow. Ford has cars and trucks, and Dell has computers. In the developed world as companies realize how costly guaranteed pensions can be, and how they impact profit, we are seeing pensions change. Although the shift to defined contribution (DC) schemes has been clear in America since the early 1990s, the financial crisis has accelerated this trend. Indeed, many Western firms no longer offer defined benefit schemes to new employees. Instead their far stingier cousin, the DC scheme, is the only option for fresh recruits as companies limit future liabilities. During the Presidential campaign both Barack Obama and Mitt Romney raised concerns about underfunded pension programs as poor management has led many pension systems to seek bailouts. State pensions have reached deficit levels of $767 billion in the U.S. The largest 100 corporate-defined pensions have hit $454 billion in unfunded liabilities.The blame for the underfunding of retirement systems, on the public level, lies generally with legislatures, which have raised pension benefits to unaffordable levels while failing to contribute enough to properly fund obligations. They've also kept assumed return rates high, making plans appear better funded than they are. Private companies have simply promised too much to workers that are living longer at a time that business pressures are changing. In the UK stock market turmoil and record low interest rates have left workers nearing retirement with private pensions worth substantially less than those who finished work three years ago. New figures show that overall pension incomes are now 30% lower than they were three years ago when the government began attempts to boost the economy through quantitative easing. Peter McDonald, a partner in the pension practice at PwC, warned that those retiring this year would be left "between a rock and a hard place", forced to defer claiming a pension until the market picks up. With stock market turmoil set to continue and this week's resumption of the Bank of England's quantitative easing program, injecting another £75bn of new money into the economy, annuity payouts are set to shrink further. The FTSE has fallen by about 15% since May, which has cut the value of many workers' private pensions schemes. Pensions are also under attack in Canada where the Harper government has decided to tighten up and reduce many of the gold-plated retirement packages that MPs and public servants have enjoyed for decades. This follows the government's decision to raise the age of eligibility for the Old Age Supplement to 67 from 65. The government could not ask Canadians to take a hit, while allowing elected officials and public servants to conduct business as usual. Under the new terms, MPs will pay 50 per cent of contributions to their pensions or $39,000 a year compared to $11,000 now. They won't be able to collect a full pension until age 65, as opposed to 55. After just six years of service, MPs are eligible to receive one of the richest pensions in the country, courtesy of taxpayers, who have been contributing $24 for every $1 an MP puts into the program. There is a new normal when it comes to investing that many have not accounted for, moderate portfolios these days are hoping for an annual gain of 5 to 7 percent. The likeliness that they will consistently earn 7.5 percent on a conservatively managed portfolio, as anticipated by its fund managers, is unlikely. Lately the markets have been hooked on monetary morphine and ignoring fundamentals. Many of the financial structures we have built are on flimsy foundations or unsustainable. If the wheels come off the financial system pension plans will take a direct hit. To those who base their future on money coming from these monthly payouts I urge caution, prepare to take a "haircut" or worse. A Helicopter Drop For England? Lord Turner is one of two leading contenders to succeed Sir Mervyn King, he has made comments in the past that might indicate what "still more innovative and unconventional" monetary policies might look like. The outgoing Financial Services Authority chief doesn't spell it out, but in the past he has talked privately about the possibility of pure money financing of the deficit, when a person's "private" comments have been mentioned publicly often enough, the word private rather loses its meaning. The most well known example of this is the so-called "helicopter drop". For example, the government could simply send every family in the country a onetime "Christmas Bonus" of a thousand pounds or roughly sixteen hundred dollars, directly financed by money created by the Bank of England. It is fair to say that Lord Turner has never publicly proposed this kind of money drop, or suggested that it should happen right away. Still the fact that a man of Lord Turner's position and experience is even hinting at this kind of solution to the UK's problems might be thought to indicate how serious he thinks problems in England have become. Of course, it also indicates that Lord Turner would not be a cautious or placid Bank of England governor. The easiest way to think about a "helicopter drop" is as a lump sum temporary tax cut, or a one-off reverse tax. This would be financed by new government bonds which are purchased by the Bank of England on the secondary market with all interest and redemption payments etc transferred back to the Treasury. This is similar to quantitative easing, to the extent that it is one part of the government lending to and acquiring claims against another. It is also similar in that it is reversible. The government could have a one-off tax increase, two years later, to get back the money that has been paid out, just as the Bank can now sell back the gilts it has bought under QE. The only real difference between QE and even more "unconventional" money financing is that, with QE, the terms on which the money is created "are flexible and sensitive to inflationary pressures", whereas in the case of a helicopter drop, the terms are more open, both can cause distortions within a market. As long as Bank rate is near zero and the Bank of England buys new gilts to replace the ones that mature, quantitative easing looks an awful lot like a "helicopter drop". But providing it has the political will, as soon as the Bank starts raising interest rates and selling back those government bonds, the similarity with Zimbabwe starts to disappear. Is this the path to economic prosperity? I think not, some may argue that it gives us more time to make tough structural reforms, others argue it allows us to postpone them. But to be effective it must be noted that even helicopter money needs to be directed. Its no good showering the country with cash to buy cheap imports. . The only answer will be time, try this, try that. Maybe even sit it out, or have a really big war, which is very unappealing. But is not given the credit it deserves as opposed to Keynsian " new deal ". US recovery & growth had more to do with WW II than the "new deal". Then again we should remember that the velocity of money, the speed that it moves throughout the system is also important and should not be underestimated. At some point one might begin to speculate that those in power might try to hit a "reset" and start over or try to introduce a new "world-currency" as a replacement to all those that are failing. As in the case of previous stimulus acts, tax cuts, or other one-off acts to get the economy moving it all depends on details. Still a system based on debt and mass consumption heavily reinforced with promises of future entitlements may not be sustainable. In the end where the money is placed, what it is used for, and where it flows does matter. CNBC's Kelly Evans did some digging and found that one state's numbers were way off the expected tally. Either they didn't make the proper seasonal adjustment or that seasonal adjustment didn't actually happen. Later on, Business Insider's Henry Blodget got word from a source that California was the culprit, because it didn't include all of its claims when it submitted its numbers—not out of malice, but because they probably got overwhelmed and simply couldn't process them all in time for the reporting deadline. Those claims will still be counted eventually, either in a future report or in a revision to this report that will come in a few weeks. With only weeks till the presidential election this left a sizable number of people thinking something fishy is going on. With a number that looks suspiciously positive for the president once again we find some conservatives refusing to believe the numbers are legitimate. But why are these statistics so questionable? The Labor Department will be the first to admit that there is considerable subjectivity in their reports. In fact, there's so much subjectivity that it is standard practice to change the numbers in the months that follow, as new, more concrete data is fed into the statistics. It is wiser to regard the report as a preliminary estimate, rather than a hard finding. There are three kinds of lies in the world. Lies, damn lies, and statistics, as the saying goes. Statistics now show that the unemployment rate plunged to 7.8 percent in September, its lowest level since Barack Obama took office in 2009. In part this was because the Bureau of Labor Statistics made big revisions to previous months, showing huge increases in the number of jobs being created. Total employment from the "household survey" showed an increase of 873,000 jobs last month, the biggest one-month jump since June of 1983. The spread between the U-3 and U-6 numbers have drastically increased by 50%. Of course, if you listen to the Obama camp, they're proud of the 7.8 figure and are trumpeting it at every opportunity as a sign that Obama's policies are finally paying off. Interesting, because that 7.8 percent number in any other year would be considered a source of shame for most presidents. The methods used to get this number include attempting to contact some 60,000 people, most by phone, and some by visit, to ask if they are working. The definition of who is and isn't working is fairly broad, Jack Welch explained in his op ed, a woman who is babysitting for a week to earn bus fare is counted as working. Welch says he believes the economy is improving, however he notes that the growth is very slow. On Bloomberg Television recently Harvard economist Steven Roach put in her place a retail sales consultant who was crowing about strong retail growth. Roach pointed out that after discounting for inflation growth in retail sales compared to past years is mostly an illusion. I wish he had gone to the next step and pointed out that what little growth does exist is built on a foundation of demand from huge government deficit spending. To make things worse the government has been forced to borrow much of that money. Part of the poor outlook for consumer spending comes from the inability for people to use their homes as a ATM, this abruptly ended in 2008 and was a large driver in causing the bubble to burst. While super low interest rates have allowed people to refinance homes and cut their monthly payments they have also devastated the incomes of those with savings causing them to curtail spending. Slow job creation, coupled with many of the jobs being created at the low end of the pay spectrum, is now being effected by another recent occurrence, hours are being cut by many employers because of Obamacare. Bottom-line good jobs are scarce and incomes are not rising. More deleveraging is facing Americans, this will go on for years. Some consumers have worked hard and paid down the debt that they accumulated, others have simply walked away from their debts and taken the path of bankruptcy. Those that remain in houses where they have not paid their mortgage for months or years have supplemented discretionary spending.Consumers Are In a Protracted Period Of Weakness, you can stop talking about strong retail sales till more good jobs materialize. In a letter sent to USADA attorneys Tuesday, Herman dismissed any evidence provided by Landis and Hamilton, saying the riders are ''serial perjurers and have told diametrically contradictory stories under oath.'' The testimony of Hincapie, one of Armstrong's closest and most loyal teammates was one of the report's new revelations. ''I would have been much more comfortable talking only about myself, but understood that I was obligated to tell the truth about everything I knew. So that is what I did,'' Hincapie said of his testimony. His two-page statement did not mention Armstrong by name. Neither did statements from three other teammates-turned-witnesses. China’s yuan climbed last week to its highest level against the U.S. dollar since the currency was reevaluated in July of 2005, The currency was buoyed by the U.S. Federal Reserve’s recent QE3 program as well as recent data showing that the People’s Bank of China has injected a record amount of cash into the financial system. While the yuan’s recent rise comes as a surprise to many considering all of the doom and gloom surrounding the Chinese economy, it is important to remember that the Fed’s QE3 program creates excess liquidity that in theory flows to the safest and highest-yielding assets. With U.S. Treasury yields low, investors are being forced to search elsewhere for return and despite the Chinese economy’s recent weakness, it is still the world’s second-largest economy with a growth rate north of 7%. Data this week also showed that China's central bank injected 365 billion yuan ($57.9 billion) into the financial system via open-market operations. The news fed a rally in Chinese stocks on Thursday. Investors worried about the lack of action by the central government to prop up the economy as it has faltered were pleased by the move to inject liquidity into the market in such a large scale and hope to see more stimulus coming down the pipeline. Looking ahead many currency watchers expect more stimulus to come through before the once-in-a-decade regime change in China to help ease the transition. Expectations for fiscal stimulus from China are so strong that industrial commodity prices have managed to climb significantly higher despite disappointing news on U.S. economic industrial activity. The slowdown in economic growth in China is unlikely to end soon, Chinese growth is being hurt by the crisis in Europe as well as the anemic U.S. economy and growth is slowing faster than some expected. "We will see the worst of the slowdown in the fourth quarter of this year, after that it will stabilize." said KimEng Tan, a senior director and analytical manager for a sovereign ratings team based in Hong Kong. He feels that while the euro-zone crisis has affected China, most of the exposure to Europe is short term and export related thus it will only hits Chinese banks indirectly. Mr. Tsang said. "Depositors have confidence in government-backed Chinese banks." A side effect and another problem for the world economy is China's major trading partners like Australia and Japan will also be hurt when China slows down. Jobs, or no jobs? Reports show that the September unemployment rate plunged, unexpectedly, to 7.8%, from 8.1% in August. It was the first time it fell below 8% since January, 2009, the month that Obama took office. More important was the reason, it fell was because people were finding work in large numbers, and not because they were just leaving the labor force as in prior months. Claims that things are kicking up came as a surprise to many of us surveying things here on the ground, and recently witnessing a slowdown in manufacturing. Non-farm payroll employment rose by 114,000, a very unremarkable number in itself but, the two prior months of July and August were revised up sharply, payrolls are now being shown to have rose a cumulative 86,000 more than first reported. That, however, is not the full story. The Bureau of Labor Statistics measures jobs two ways: the well-known payroll survey of employers, and the lesser-known survey of households, which yields the unemployment rate. Most the ruckus is being caused by the latter survey which shows the number of people with jobs skyrocketed by 873,000 in September from August. It must be noted that the household survey numbers are extremely volatile. So whats the bottom line, how should we interpret these numbers? This is the largest gain since January, 2003, but remember January figures are often distorted by annual revisions, you have to go back to 1983 to find a monthly gain this big outside January. Moreover, the gains in payroll employment, for a change, got a big hand from government; state and local jobs have climbed a relatively hefty 72,000 in the last three months. This does not add to the argument that all is well in the private sector. Many of these new jobs are low paying and often part time, it should also be noted that we saw a huge jump in the hiring of new workers without highschool diplomas, that is somewhat baffling. I remain unconvinced.